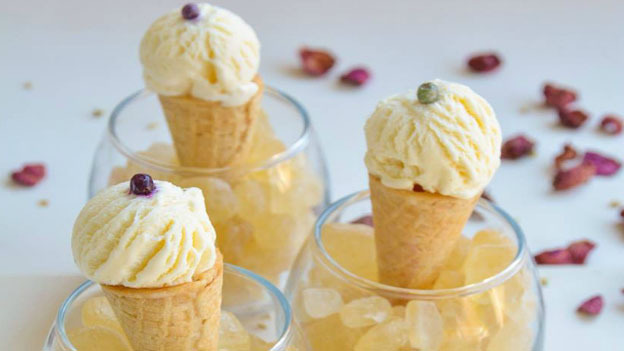 Elderflower gelato is a refreshing treat to enjoy on a warm afternoon. Prepare the ice cream machine by freezing the machine’s ice cream bowl for 8 hours or overnight. To a medium saucepan, add the salt, sugar and rice flour and whisk to combine. Add 2 tablespoons (30 ml) of the cream and whisk to make an even paste. Over medium-low heat, start whisking in the rest of the cream and cook, stirring, for 3 to 5 minutes, until the mixture bubbles a little and it thickens a bit. Off the heat, whisk the cordial in and combine well. Pour the mixture into a bowl and cover it with plastic wrap so the mixture doesn’t form a skin. Let this chill in the refrigerator for 8 hours or up to overnight. Pour the chilled mixture into the frozen ice cream bowl and let the mixture churn for 18 to 20 minutes or according to the manufacturer’s instructions. Transfer the gelato to a freezer-proof container and let it chill for at least 4 hours. Note: Regular rice flour is typically made by grinding medium- or long-grain rice into a powder. Superfine rice flour is made by grinding short-grain and/or sticky glutinous rice into a finer powder. This produces flour with higher starch content that will dissolve much easier, making it ideal for thickening liquids. Thank you to Mia Wasilevich, owner of Transitional Gastronomy in Los Angeles for sharing this recipe on EdibleWildFood. Mia is a chef and wild foodie who transforms wild food into outstanding gourmet meals. Be sure to visit her website Transitional Gastronomy.